The Global Cassava Partnership for the 21st Century (GCP21) and International Institute of Tropical Agriculture (IITA) have called on policymakers, donors and the international community to support efforts that will bring about cassava transformation in Africa. Despite the key role cassava is playing in Africa’s food security, its production has remained low at about 9 tonnes per hectare, keeping the growers in the trap of poverty. The Director of GCP21, Dr. Claude Fauquet, said the African continent needs about 30 tonnes per hectare of cassava by 2050 from the current 9 tonnes per hectare. Fauquet who stated this in Lagos at the world press conference to announce the fourth International Cassava Conference tagged, “Transformation of Cassava in Africa,” billed to take place in Cotonou, Benin Republic, in June, said cassava has become central to food security in the developing world and has become the fourth most important crop after maize, wheat and rice. According to him, Africa currently produces about 10 tonnes per hectare of cassava. He stated that Africa needs more science in the cultivation of cassava because its population and that of Nigeria, especially, will double by 2050. He added: “Africa needs transformation in the cultivation of cassava, otherwise, there will be a major food problem by 2050 if cassava remains less than 10 tonnes per hectare. 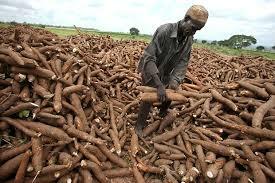 We need to change the yield of cassava. Cassava is grown in 106 countries; Africa is 55 per cent while Latin America and Asia grow 12 and 33 per cent respectively. However, Fauguet said that though Nigeria is a big weight in cassava production in the world, it is not yet meeting its citizens’ demands, adding that Benin Republic currently produces more cassava per head than Nigeria. Nigeria, he said, produces the highest but in comparison with its population, it is not doing enough. Meanwhile, the Director Designate of GCP21, Prof. Malachy Akoroda, said that IITA was set to partner with stakeholders globally to improve cassava production. Akoroda said that partnerships and reviewing successes of other countries would ensure cassava sustainability and development. The conference, which will attract investors from Brazil and other bigwigs in the cassava value chains would also focus on technology, access to finance and market.